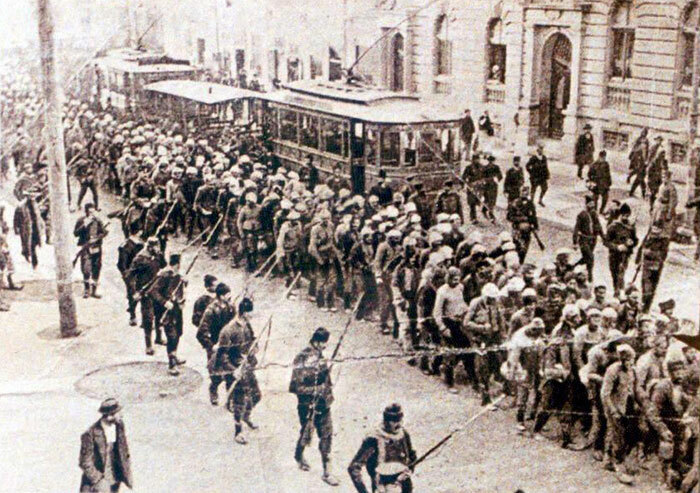 During the Balkan Wars of 1912-1913, Serbian forces invaded and conquered Kosovo, northern and central Albania and much of Macedonia both in a drive to expel Ottoman forces from the Balkans and as a simple land grab. The central European powers, Germany and Austria-Hungary, were hostile to Serbia's expansion into the southern Balkans and shocked at its Albanian extermination policies, as reflected in the following front-page editorial published in the "Frankfurter Zeitung" in March 1913, a year and a half before the outbreak of the First World War. In our third morning edition, our private correspondent in Üsküb [Skopje] brought us the shocking news that 300 Albanians have been shot by the Serbs, once again without trial. The report will of course be denied, as have all of the proven crimes and atrocities committed by the military leadership of that Balkan country. No objective observer in Europe attaches any value to such denials. With regard to the theatre of war in Albania, no one can accept the excuse that the crimes were committed by irresponsible bands called comitadjis over whom the Serbian army command had no control. In this particular case, regular Serbian soldiers seem to be behind the bloodbath, but even in cases where terrible massacres were committed by irregular auxiliary troops, there is no doubt that they occurred with the tacit permission and will of the Serbian authorities. At the beginning of the war, the Serbian authorities told us quite openly: “We are going to exterminate the Albanians.” We feel it is our duty to expose the intentions of the leadership in Belgrade since this policy of systematic extermination is being carried out unabated, despite all European protests. The gentlemen will deny everything, being confident that journalistic tact will prevent us from naming names, and it is evident that we would not do such a thing if we were not absolutely sure of our sources. The sources for the terrible reports on the appalling military conduct of the Serbs in Albania are not Turkish. Nor do these reports stem from Germans and Austrians who might be accused of being friendly to the Turks, but rather from representatives of the Triple Entente, in particular English reporters. In addition to this, it is no secret that the consular reports of most of the European countries confirm these happenings. Recently things were somewhat quieter, but now, all of a sudden, comes this report that 300 tribesmen of Luma, caught unarmed, were shot in Prizren. Luma is a district with a town of the same name that is located west of Kalkandelen [Tetovo], but on the right bank of the Drin, i.e. just over the border in that part of Albania accorded to Serbia by the Ambassadors’ Conference. They seem to want to make a clean sweep of things. What does Europe have to say about the slaughter of a people who have already been subjected? […] What is certain is that the rulers in Belgrade know exactly what is going on in Albania. But they also know that they are dependent upon the goodwill of Europe for their control of Albania and for many other matters. It is high time that the Great Powers make it clear to them that a state ruled by barbaric instinct will be treated differently by them than a civilized country. Is our sense of humanity not strong enough for Europe to exert influence on its diplomats? It seems to us that, for political reasons, the leaders of the Triple Entente should take the lead here because they would be less suspected of self-interest than Albania’s neighbours, Austria and Italy, and Germany that is allied to the latter countries. If there is but a spark of the spirit of Gladstone in the present liberal government of England, it will take the lead and put an end to these barbaric doings in the Balkans.